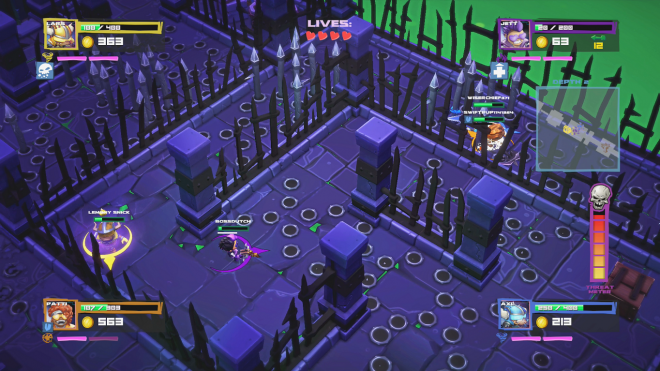 'Super Dungeon Bros' comes to us from Utah-based React Games (previously known as Studio 4d1), which has made a name for itself developing mostly mobile and social media games. 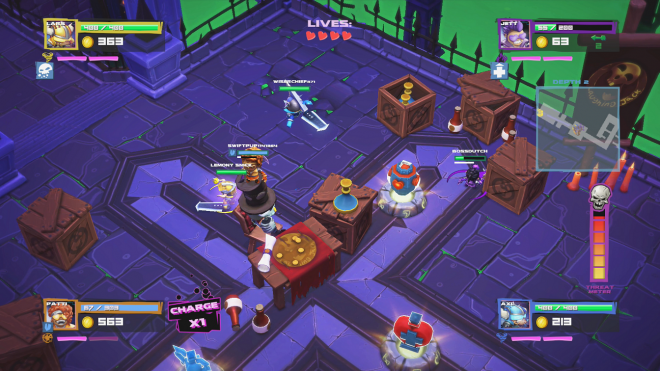 'Super Dungeon Bros' is billed as a co-op rock-themed dungeon crawler. The game debuts as one of the Xbox Games With Gold for early November but is also available for PC and PS4. At the time of writing there's some free DLC, the 'Broettes' pack. 'Super Dungeon Bros' is a top-down hack-and-slash with cutesy little characters inspired by things like 'Gauntlet' and of course heavy metal. The "bros" and "broettes" can equip different weapons with varying stats for attack speed, damage, and so forth. There's a ranged weapon too, which is a bit harder to control. Each combatant also has a bunch of attacks and magical spells, and there are some pick-ups on the ground, hidden in destructible objects, or left behind by fallen enemies. Each dungeon is procedurally generated and a threat gauge increases over time - if I lingered too long while clearing out the mobs, they would become disastrously difficult. Timed gameplay in most genres is gratuitous; here it's actively working against itself. I can't ever remember a time I was playing a crawler and thought, "man I wish the game would hurry me along by having a steadily increasing difficulty level, the pace I'm setting for myself is too slow". As dungeon crawlers go, 'Super Dungeon Bros' struggles to establish engaging gameplay even as an imitation. These are all things that have been done before, and they've been done better. In some ways a lot better. There are a few interesting inclusions, like the bros being able to carry each other along while still fighting. I noticed this for the first time as I was playing a crossbro (I reluctantly apologize for the awful puns) and another bro just grabbed me and started controlling my movement. It made him into a mobile turret, and it helped me out by not dying as much because I could focus on just my shooting. We still died a lot though, and the death penalty is pretty high. It's so high that 'Super Dungeon Bros' is really only feasible when played with others; the single-player is frustrating. Controls are sticky and imprecise, not a good sign for an action game. The bros just aren't that fun to move around and swing axes. While they're doing the slow axe-swinging, they also say a lot of the same lame lines over and over. These are spoofs from 'Wayne's World' and other old movies - some references I got and some I didn't but none of it was very funny. That's a big part of 'Super Dungeon Bros,' the metal/slang combo humor attempt, and like the gameplay it doesn't really work. There's also not a whole lot of loot. Weapon choices are limited; this isn't a 'Diablo' or 'Borderlands' where you're swapping out gear constantly, or even at all. There's a little bit of character development in terms of using collected gold to upgrade weapons and such but it's bland and uninspired. I won't say that it's a mobile game, but it's also not a high-quality experience full of fun content, good humor, and innovative gameplay. The only time I really had any fun was when I played with friends, although it's difficult to say if it was just because I was gaming with friends, which is always a good time. Even so it didn't hold our attention for very long and we switched to something else. This is a colorful, bright game but not particularly advanced with its visuals. The procedural dungeons all look samey before too long, although there are different areas with their own themes. The framerate isn't bad but as I mentioned before, the controls aren't very responsive and my character has a tendency to not jump where I want it to, throw items in the wrong direction, and so forth. 'Super Dungeon Bros' doesn't have a great variety of music and mostly fails at any attempt to sympathize with the metal genre, even in a satirical capacity. The voice acting is repetitive and I tended to turn down the audio as I played, to listen to my friends' voice comms or something else entirely. With the procedural generation and all, any dungeon crawler should thrive with replay value. 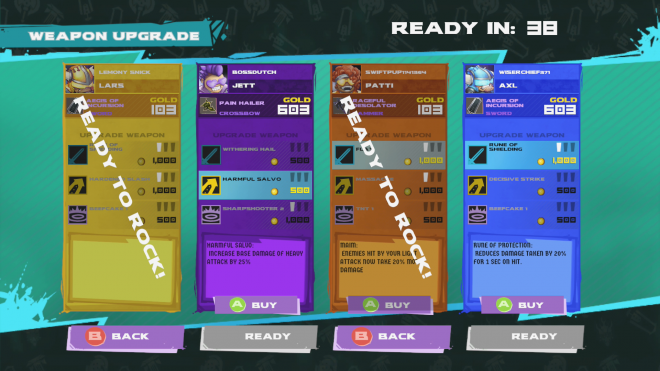 You collect better loot, upgrade your little guy, buy cooler powers, and so on. 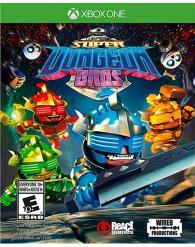 'Super Dungeon Bros' doesn't have any of that to speak of, at least not worth spending hours in the same dungeon for. I'll admit I was looking forward to 'Super Dungeon Bros' before playing. I love the genre, and a caricatured metal mash-up could have been interesting, but the game disappoints on all fronts. I like how much emphasis React put on co-op but it needed more under the hood - more choices for character building, more control, more abilities, just more.